One of the foods I obsess over when I am in Japan is Tamago Sando. They are sold at all the convenience stores like Lawson, 7-Eleven and FamilyMart. There is something so simple about them and yet so delightful. 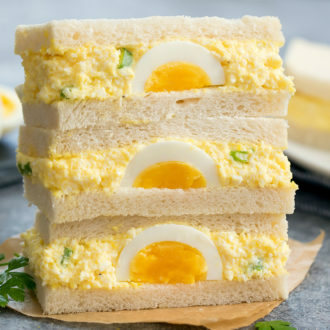 I first heard about egg salad sandwiches on an episode of Anthony Bourdain’s Parts Unknown. His favorite was the version from Lawson and after trying from the three chains named above, that version is my favorite as well. However, I thought they all tasted pretty darn good and it just comes down to personal preference (i.e., if you prefer the egg salad to be more blended versus leaving in some egg chunks). 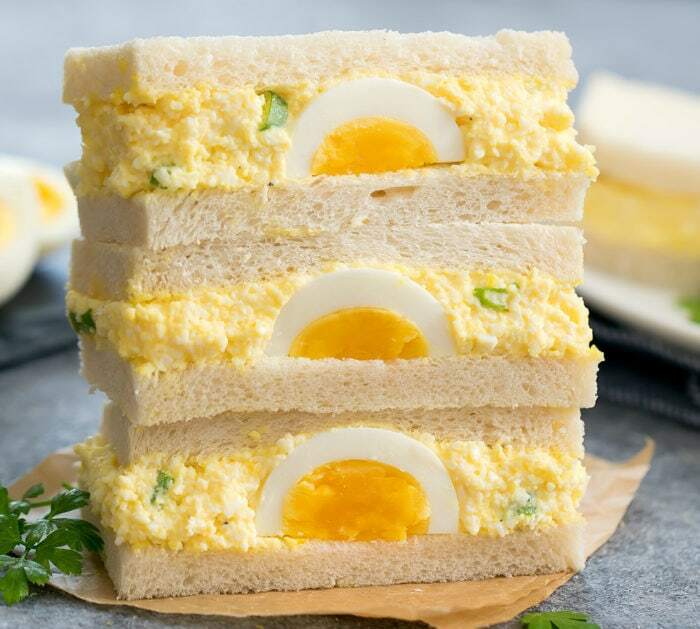 There are a few things that make these sandwiches stand out for me: the incredibly soft sandwich bread and the fluffy egg salad filling. Traditionally, these sandwiches are made with shokupan, a Japanese milk bread. You can make your own or buy it at the bakery section of Japanese grocery stores. I bought mine. I have not made shokupan before, but I do have a milk bread recipe that is very similar to shokupan. If you don’t have access to a Japanese grocery store, any soft white sandwich bread will work. 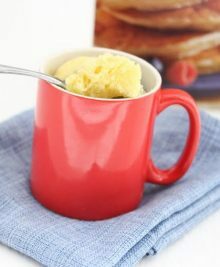 If you are on a low carb diet, you can also try this with my low carb keto mug bread recipe. The egg salad filling ingredients are very basic: egg, mayonnaise, salt and pepper. That is all. For the mayonnaise, the Japanese use kewpie mayonnaise, which is more yellow in color, creamier, and sweeter than American mayonnaise. You can buy kewpie mayonnaise at Japanese grocery stores. However, you can substitute with American mayonnaise. I couldn’t resist adding in some scallions just to break up the color and add some brightness, but this is not something normally found in the egg salad. I also made a version that has a soft boiled egg piece in the middle. Again, this is not something I ever saw in Japan but I’ve seen it a lot on the internet lately, thanks to Konbi, a cafe in Los Angeles that has put their own spin on the Japanese classic. These simple sandwiches are delightful to eat. They are very popular in Japan and can be purchased at convenience stores. Now you can make it at home, too! Cut eggs into fourths. Add eggs, mayonnaise into food processor and blend until desired consistency. You can let the eggs be completely blended or let them remain as small chunks. Season with salt and pepper to taste. Add more mayonnaise if needed. If you are using scallions, stir them in. Spread egg filling evenly across four of the bread slices. Place remaining slices over filling. Slice sandwiches in half and serve. I cooked my eggs in the Instant Pot. 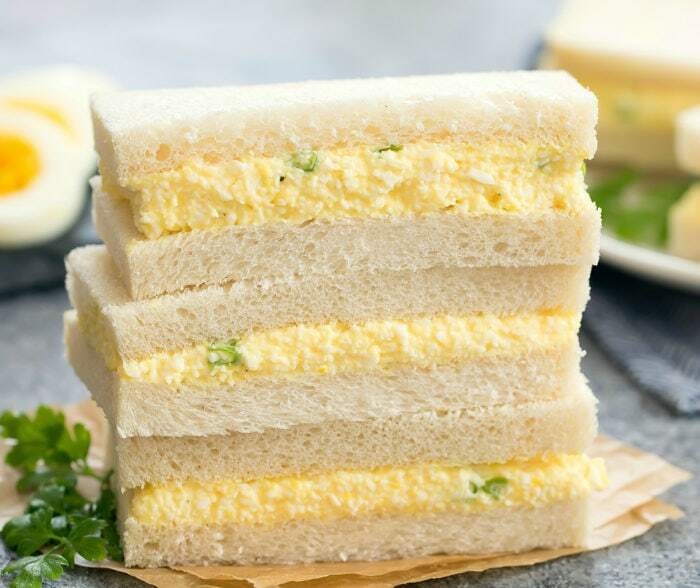 Traditionally, these sandwiches are made with shokupan, a Japanese milk bread. You can make your own or buy it at the bakery section of Japanese grocery store. I bought mine. 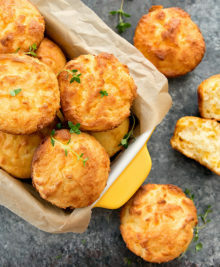 If you want to make your own, I have a milk bread recipe that is very similar to shokupan. If you don't have access to a Japanese grocery store, any soft white bread will work. The nutrition estimate does not include the bread because brands and styles of bread are so nutritionally different. You can substitute kewpie mayonnaise with regular mayonnaise, but keep in mind the nutrition estimate was calculated using kewpie mayonnaise. I added in some scallions, but this is not something normally found in the egg salad. 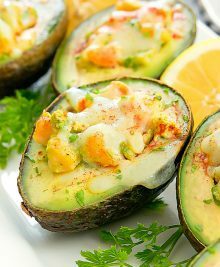 If you want to make the version with the egg in the middle, cook 1 soft boiled egg. Peel and slice into fourth. 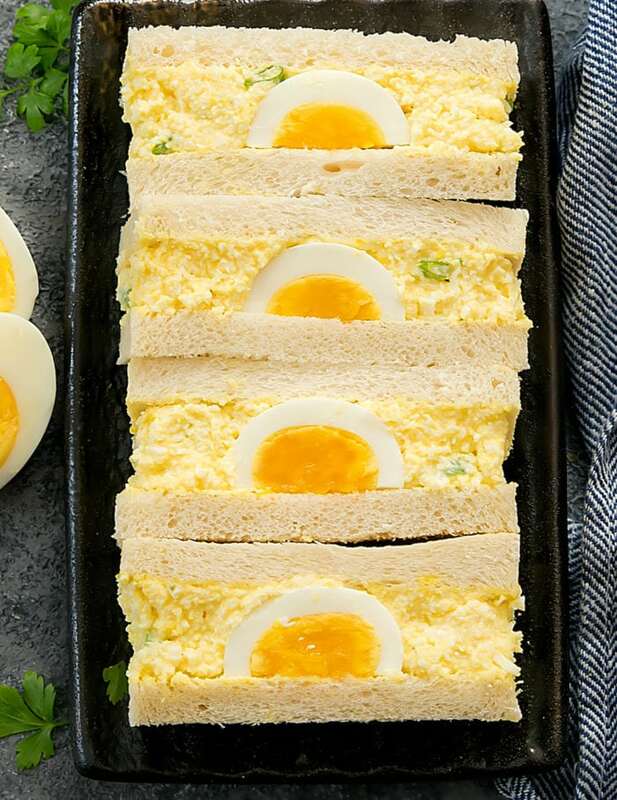 Place the eggs on the bread slices before adding the filling. Then top with remaining bread slices. I have a potato masher that has small square holes in its metal plate. It is also the perfect egg masher for these sandwiches. I’ve had my masher for years and wonder why they’re so hard to find. 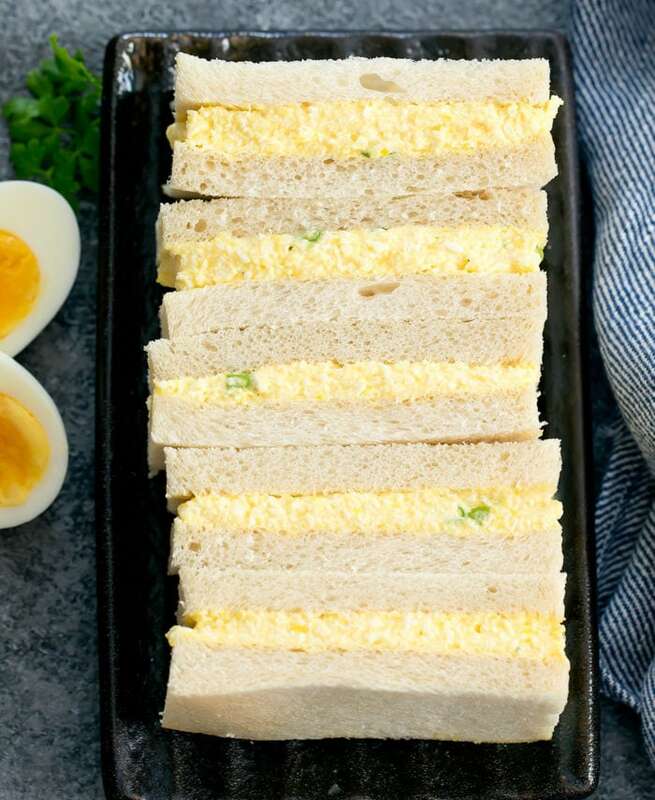 These are just egg salad sandwiches, not sure how they differ from the American version. They differ in many ways. The Japanese version is only seasoned with salt and pepper. American version is usually more acidic as it uses mustard, lemon juice, etc. Japanese version is just eggs. American version usually includes celery, herbs, sometimes lettuce. 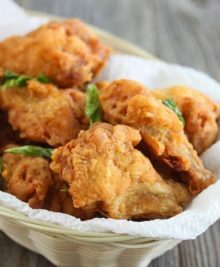 The Japanese version also pulses the eggs down a lot more so it is like a creamy fluffy paste. They also use a very soft white bread and remove the crusts so the entire sandwich is very soft and fluffy.